Clean Streak Inc. is a fully integrated janitorial cleaning services company that provides comprehensive, high quality, reliable cleaning solutions to commercial, corporate, and industrial clients. Our diligent management and work ethic are central to Clean Streak Inc.’s business philosophy and is critical to delivering consistent, quality cleaning services. We pride ourselves on making our management accountable to the client through direct access and interaction with our managing director. Aims to be a national market leader in the provision of cleaning services delivering reliable, quality, cost-effective cleaning solutions to our customers. We are committed to our customers, and the facilities we service through continued environmental education for our employees. We have 4 locations across the Carolina’s. All of these locations are committed to the same common values and principles. Our vision is to continue to grow and add locations. Our high ratings are consistent among all of our locations, and we have maintained an A+ rating with the Better Business Bureau. Clean Streak Inc. is a family owned business with a large group of specially trained, dedicated employees to provide professional service with a personal touch. Horace Adell, President of Clean Streak, Inc., has been an entrepreneur in the cleaning industry for over twenty-five years. He has been recognized in the Congressional Record of the United States House of Representatives for winning the 2010 WNC Minority Business Person of the Year award. He is a member of the Cleaning Management Institute and has served as an instructor in floor cleaning courses at Asheville-Buncombe Technical Community College. His giving heart almost outweighs his extreme work ethic. Horace has received numerous awards for his charitable contributions to his communities. Currently Horace oversees operations in our Myrtle Beach location. Susan Adell is the company’s Marketing Director and has been with Clean Streak since 2009. She was nominated for a Henderson County Chamber of Commerce Athena Award for outstanding female entrepreneurs in 2011. She founded the Mills River Business Association and currently serves as its President. Following Susan’s arrival, Clean Streak has grown 52% in the past three years. Brittany started with the company in 2012. Starting as a crew leader on one of our cleaning teams, Brittany lead by example, showing our customers what attention to detail really looks like. Brittany was promoted to our bookkeeping department in 2018 and quickly began to adopt more roles and responsibilities, showing that there isn’t a job she can’t handle. Today Brittany oversees operations for the entire company. With a bachelors in business administration from the University of NC at Charlotte. Alex has been with Clean Streak Inc. for over a decade. It doesn’t matter how dirty, how far, how high up, or how long it will take Alex will get it clean. He is both skilled, and one of the most dependable employees Clean Streak could ask for. Trained and mentored by Horace himself, Alex is second to none in the cleaning industry. Jency Started with Clean Streak Inc. in early 2018 as an administrative assistant. She is currently the office manager for our Asheville, NC office. Jency goes above and beyond to help our employees, and customers have the best experience. April joined the Clean Streak Inc. family in January 2019. She is the leader of our largest contract for First Citizens Banks. She works tirelessly to keep our Charlotte region customers happy. April came to our company with over 30 years of experience in the janitorial field. Our goal is Your satisfaction (of course after our cleaning work). Office Phone works around the clock (24/7). Excellence and Innovation: We provide training to our personnel in order to ensure the high standard of service. We stay up-to-date on the latest innovations in eco-friendly products and technologies, allowing us to bring the best in to our clients’ homes. History of Clean Streak Inc.
Clean Streak Inc. is widely recognized for our commitment to serving our customers while staying friendly to the environment. We have a history of excellence and dedication to our clients, providing professional and high-quality cleaning services across America. Expansion began in 2014 and we are currently servicing 15 counties across NC & SC. 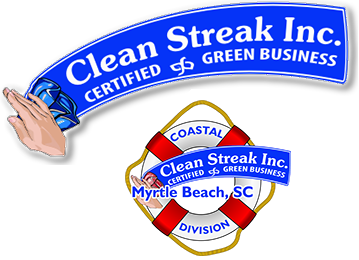 Clean Streak is a North Carolina business originally founded in 1998 and incorporated as an S-corporation in 2006. The principal shareholder is Horace Adell. Clean Streak is a H.U.B. certified Veteran Owned and Minority Owned business. Clean Streak Inc. has received growth awards from both the Asheville Area Chamber of Commerce and the Henderson County Chamber of Commerce year after year. Your satisfaction is 100% guaranteed at Clean Streak Inc. If you are not happy with any area we’ve cleaned, simply call within 24 hours and we will come back out and reclean it free of charge. This makes hiring Clean Streak Inc. virtually risk free. Our maids are thoroughly screened through our rigorous recruitment process, and every one of them goes through our Maid University training process. Choose us because of our reputation for excellence. For more than 20 years, we’ve earned a name for quality and customer service. The business owners we serve rely on us for detail-oriented, consistent cleaning services, every single time we clean their properties. The experts at The Clean Streak Inc. are committed to providing thorough house cleaning services for our valued customers nationwide. In order to accomplish this goal, we adhere to strict standards that remain consistent across the board. Our company is fully bonded and insured, which means you can have peace of mind when you hire us as your commercail cleaning company. Helping our customers feel confident in our services is very important to us. It means every individual hired at a franchise location of Clean Streak Inc. goes through a thorough screening process, and then is trained in every aspect of our home cleaning services. This ensures high-quality service every time. You should be able to enjoy peace of mind knowing that your office space is in good hands while focusing on things that matter more to you, such as your family and loved ones. Clean Streak Inc. service is the key to keeping a beautiful home while making more time for yourself and the things you love most. Contact us for a FREE estimate. Clean Streak Inc. strives to provide the highest level of quality, service and value to each and every customer. If you are not completely satisfied with our service, please inform us within 24 hours of your clean so we may resolve the situation.